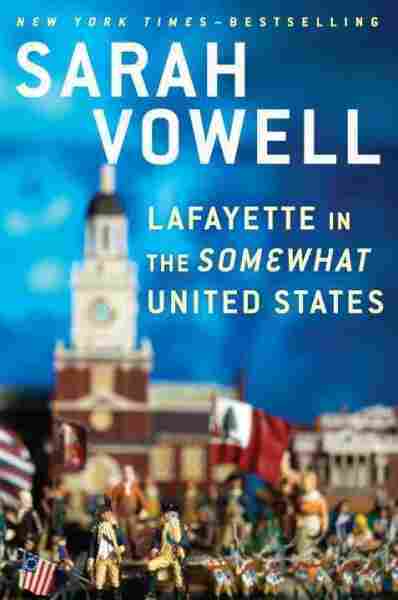 Review: 'Lafayette In The Somewhat United States' By Sarah Vowell Sarah Vowell's charming not-quite-a-history gives us a young, glory-hungry Marquis de Lafayette, and the Founding Fathers not as marble statues, but as real men who bicker, bumble and snore. Be careful about calling Sarah Vowell's latest a history book. The term fits in the broadest sense, sure — but for many, that phrase may also drum up visions of appendices and ponderous chapter titles, obscure maps and pop quizzes. Knee-deep as it may be in the history of the American Revolution, Lafayette in the Somewhat United States doesn't look or act much like its textbook brethren. Gilded with snark, buoyant on charm, Vowell's brand of history categorically refuses to take itself — or any of its subjects — too seriously. That's not to say her subjects aren't serious. Here she dives into the tale of the Marquis de Lafayette, the French aristocrat who, as a glory-hungry teen, crossed an ocean to join a revolution in a land he'd never before visited. Braving danger, befriending George Washington and taking bullet wounds on behalf of the rebellious colonists, Lafayette earned more than a generalship in the newborn Continental Army. He became America's "best friend" — and, little did he know, fodder for street names and city parks across the U.S. Given how painfully august Lafayette and the American founders have gotten centuries later — cast as they are in marble and framed on our currency — it's awfully refreshing to see Vowell bring our founders down from their lofty pedestals. In her telling, they're just men again, not the gods we've long since made of them. They are at turns jealous, miffed and petty-minded. They bicker and bumble and sometimes screw up royally, and with the glamorous veneer of history stripped clean, sometimes they look downright awkward. I'm thinking here of Lafayette himself, all dressed up as a general and with no one to command for months — or of the Continental Congress, who, after getting harried out of Philadelphia by the British, spent their nights in exile as reluctant bunkmates in a tiny town. "It's possible that over the course of the revolution, the greatest threat to the stability of the Continental Congress wasn't the rift about the morality of slavery but rather the long and grating nights the delegates spent in York, hearing each other snore," Vowell remarks. This extends to the big things, as well. In a running commentary on each quote she culls from the source material, Vowell's sure to interrupt with many of the less-flattering details they choose to forget, and that some other histories tend to forget, too. Take, for instance, the wife and child Lafayette left behind in France for his New World adventure, or the fact that King Louis XVI's fiscal generosity toward the colonials may have been better spent on his own starving people — some of whom decided to behead him a few years later. And, when Lafayette "fawns" over America on his arrival, saying, "Simplicity of manners, a desire to oblige ... a sweet equality reign here among everybody," Vowell retorts: It "was, in 1777, the kind of thing only a white guy could say." Still, Vowell embraces all the figures involved with sympathy, and with the brash enthusiasm of an amateur — or, as she self-identifies, a "historian-adjacent, narrative nonfiction wiseguy." Perhaps that's why she's got no problem infusing the typical history fodder — stuff like primary sources and scholarly records — with comments from war re-enactors, anecdotes from her visits to battlefields, and even the occasional puppet show. All this is to say she has a high tolerance for digression, which can be both a great thing and a not-so-great thing, often even within the space of a single anecdote. Asides, like conversations with the modern-day Quakers who now find a war memorial planted on their property, can lend context and humor — before becoming distracting and a bit cloying in their forced quirk. And Lafayette himself disappears for long stretches of the book that bears his name, bumped from the scene as Vowell labors to cover all the war's high points. These qualities, both for better and for worse, should be familiar to people who have read Vowell's work before. At once light-footed and light-hearted, her histories are — dare I say it — fun. And Lafayette is no different. Even amid defeats at Brandywine and despair at Valley Forge, loose tangents and a misplaced quip or two, Vowell emerges from the Revolutionary War with an unabashed smile on her face. I'd be surprised if her reader doesn't, too.